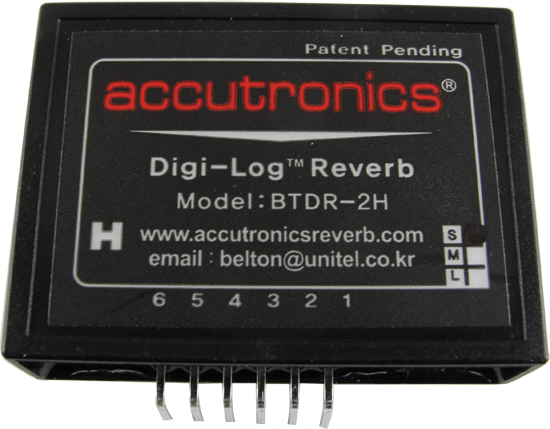 A great digital reverb sound that easily replaces a spring reverberation unit. Horizontal mount. Please see http://www.accutronicsreverb.com for more info. Long (2.85 seconds) P-RBTDR-2H-L Packaging Dimensions 5.8 in. x 3 in. x 0.8 in. Medium (2.5 seconds) P-RBTDR-2H-M Packaging Dimensions 5.8 in. x 3 in. x 0.8 in. Short (2 seconds) P-RBTDR-2H-S Packaging Dimensions 16.25 in. x 4.125 in. x 1.125 in. This is a great module. It requires very little support circuitry to create a very nice reverb unit. These are good. Perfect for making small digital reverb pedals. I have used these before, they sound great & are really compact too! Asked by Anonymous on October 7th, 2018. There is not one available at this time. You can refer to the technical data sheet for the required sizing for this module.